As a way of saying thank you,we offer a variety of gifts for your generous support. 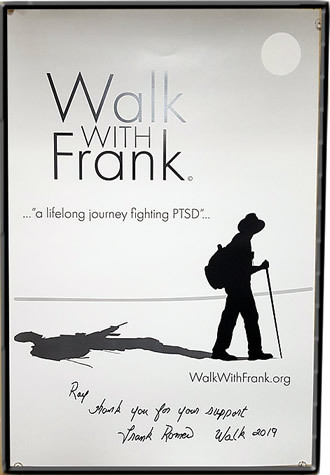 Receive a 13 x 19 Personalized Walk With Frank Poster. Each poster is printed on durable card stock signed by Frank, and is suitable for framing. Receive a beautiful combo gift set (pictured above). Set includes one 1.5″ baked enamel lapel pin along with a double sided Adult sized black silicone wrist band. Both gifts are emblazoned with our PTSD AWARENESS message and our Walk With Frank logo. Receive our 1.5″ baked enamel lapel pin emblazoned with our PTSD AWARENESS message and our Walk With Frank logo. Receive our double sided, Adult sized, black silicone, wrist band emblazoned with our PTSD AWARENESS message and our Walk With Frank logo. For credit card purchases use our PayPal donate button below. “Add special instructions to the seller” link on the PayPal Donate page.